PHOENIX (July 13, 2018) – GlobalTranz Enterprises, Inc., a leading technology-driven freight management solutions provider, has been voted an Inbound Logistics Top 10 3PL Provider. GlobalTranz was selected for its full-service logistics and supply chain solutions that help more than 25,000 businesses across North America gain efficiency and control of their supply chain. This marks the 4th consecutive year GlobalTranz has been recognized by the publication. Inbound Logistics has long been regarded as a leading definitive resource for business logistics and supply chain professionals. Each year, Inbound Logistics readers and logistics professionals vote for their top 3PLs based on their ability to demonstrate excellence in service, quality, and meeting the needs of shippers and carrier partners. 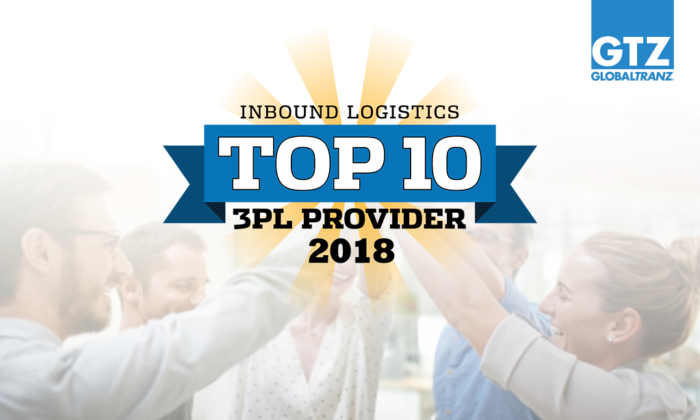 The Inbound Logistics 2018 Top 10 3PL Provider list appears in the July 2018 print and digital edition of the publication. The list will also be posted online on the Inbound Logistics website. Readers will be able to visit the website and enter their outsourced logistics requirements to match the solutions for providers that best meet their needs. Inbound Logistics has recognized GlobalTranz for the past four years, notably earning a spot on their Top 10 3PLs to watch list in 2017, and their Top 100 3PL list in 2016 and 2015. Ranked a Top 10 Freight Brokerage by Transport Topics. Ranked ninth largest private company in Arizona by Phoenix Business Journal. Recognized for the seventh consecutive year as one of the fastest-growing companies in Arizona by Phoenix Business Journal. Honored by ACG with the Arizona Deal of the Year Award for its acquisition of Global Freight Source. CFO Renee Krug was named 2018 Distinguished Woman in Logistics by Women in Trucking Association, 2017 CFO of the Year Arizona by CV Magazine, and received the CFO Award from Finance Monthly. Chairman and CEO Bob Farrell was awarded the 2017 CEO Award from CEO Today. COO Kirsten Hall was recognized with the Women in Business Award from Minneapolis St. Paul Business Journal. General Counsel Jeffrey Simmons received the First Chair Award for Top General Counsel. Inbound Logistics is the leading trade magazine targeted toward business logistics and supply chain managers. The magazine’s editorial mission is to help companies of all sizes better manage corporate resources by speeding and reducing inventory and supporting infrastructure and better matching demand signals to supply lines. More information is available at http://www.inboundlogistics.com. BAM Freight has partnered with Globaltranz because we believe the Globaltranz platform and vision to truly be the future of freight. Globaltranz has consistently demonstrated they are dedicated to the success of their agents and customers. Click here to learn more about how Globaltranz and BAM Freight work together.